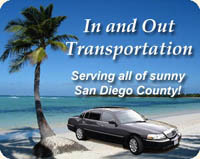 In and Out Transportation is San Diego's premier transportation service. We have a well maintained fleet of high end luxury Lincoln Town Car sedans (4 passenger) and shuttles. You may call to make a reservation at (858) 279-5110 or (858) 752-3329.